In time for Valentine’s Day, Boost Drinks is launching Boost Energy Red Berry 250ml, backed with love-themed advertising across Tinder. Described as a flavour explosion of mixed berries, Red Berry is a new flavour for the shelves of Great Britain but is tried and tested in Northern Ireland, where it is currently the second best-selling soft drink (IRI). This brings the total number of 250ml SKUs in the Boost Energy portfolio to seven. Like the other variants, Red Berry is available as a 49p PMP – a great value price point that hasn’t changed in over a decade. 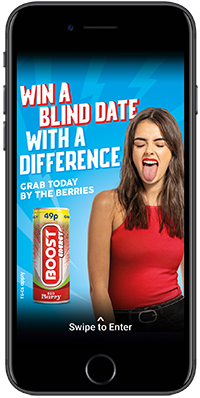 Simon Gray, founder and managing director of Boost, says: “We know that our Northern Irish consumers and retailers just can’t get enough of Red Berry, so much so we have just launched it in a new 500ml SKU for them. It was only right that we brought the flavour to the market across the rest of the UK. To assist the launch of Red Berry, Boost has joined forces with Tinder to give consumers the chance to win a dream date. The competition is being advertised on the dating specialist’s platform, which reaches millions of people across the UK every day, as well as on the websites of national media such as Heat magazine and the Daily Mail. The prize includes a meal where celebrity host, Vicky Pattinson, will talk to the daters through an earpiece to ensure they have less awkward silences and only the smoothest of chat-up lines. All of this will be captured as Youtube videos, which will be shared across Boost’s social channels. Boost will also be backing the new flavour with extensive media advertising in London and Manchester and billboard advertising in retailers’ windows in London and Glasgow. Further support includes a sampling campaign in Glasgow during Valentine’s week and a mail-out of Valentine’s cards to key retailers across the country.